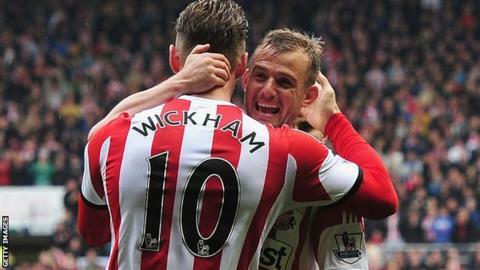 Sunderland midfielder Lee Cattermole says striker Connor Wickham's form is evidence he has "grown up" and taken his chance under head coach Gus Poyet. The 21-year-old has scored five goals in three games to help boost the Black Cats' Premier League survival hopes, and has started the last four matches. "Only he knows what's changed," Cattermole told BBC Newcastle. "It was always going to be a case of Connor growing up and becoming a man. "He's given a chance at a time when he's been playing games, not sat still and that's important. "He came here as a boy and he's getting better and better - and the lads will keep demanding from him." Victories over Cardiff and Chelsea, added to a draw against Manchester City, have reinvigorated Sunderland's hopes of escaping the drop. Since earning a point in that 2-2 result at the Etihad, Gus Poyet's side have clambered out of the relegation zone for the first time since February, with three games to play. "We've found some belief and players hitting form," Cattermole added. "That's what we want - we need some heroes at the moment. "We thought if we could go into the last two home games with our fate in our own hands - if we win our games - that would be the aim and we have that chance now. "Hopefully it (safety) will be done sooner rather than later."